Imagine your advantage in negotiations, decision-making, and leadership if you could teach yourself to see and evaluate information that others overlook. 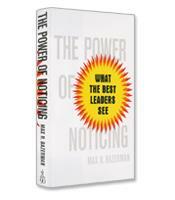 The Power of Noticing provides the blueprint for accomplishing precisely that. Max Bazerman, an expert in the field of applied behavioral psychology, draws on three decades of research and his experience instructing Harvard Business School MBAs and corporate executives to teach you how to notice and act on information that may not be immediately obvious. In many ways, The Power of Notic­ing, the latest book from the prolific Max Bazerman, will somewhat dis­hearten his readers - if not enrage them. In sometimes horrific and often damning detail, Bazerman exposes the disastrous consequences of having leaders with blinders on who fail to notice - or pretend not to notice - what is truly happening around them. Morton Thiokol and NASA scientists failed to notice the pattern of low-temperature failures of its O-rings and, as a result, went forward with a low-temperature launch of the Shuttle Challenger. Seven astronauts lost their lives in the ensuing mid-air explosion. Penn State officials and staff, from the president of the university, to the famed coach of the football team, to other coaches, failed to take decisive action, not even calling the police, in the face of recurring reports of rapes of young boys by assistant coach Jerry Sandusky. Enron’s Board of Directors, despite specific accu­sations from a whistleblower and a warning from the company’s auditors that Enron was “pushing the limits” of accounting propriety, did nothing to investigate the possibility of wrongdoing. Ask for the data. Many decisions are made based on the data presented. Decision-makers need to deter­mine if more data is needed and what kind, and then to request that data. NASA scientists could have received the cold-temperature test results from Morton Thiokol and prevented the loss of seven lives. Attack motivated blindness. Often, leaders who look the other way in the face of wrongdoing have deep-seated motivations to do so - such as protecting their university (the Sandusky scandal) or the church (in the case of the Catholic Church scandal).The solutions are clear: leaders have the responsibility to fully notice the facts and to act when it’s appropriate. And those who fail to act on reports of wrongdoing must face clear conse­quences. Finally, leaders must provide decision-makers in their organizations with the incentive to speak up. Systemic changes. Bazerman has been working for years to convince policy makers to reform the auditing industry, in which companies pay the auditors - thus creating an almost insurmountable incentive for audi­tors to please their paymasters. Industry blindness occurs in many other industries and must be equally addressed with reform. As with most of his works, The Power of Noticing offers Bazerman’s uniquely qualified insight into how the world works and how it should work.